Plenum HDMI Cables provide the fire protection to run these cables in the walls or Air Plenums without a conduit. Our Plenum HDMI Cables are built to last and perform to the highest expectations. The cables are featured with 24AWG oxygen free pure copper conductors, triple shielding to reject EMI and RFI, and gold plated connectors. CMP certified jacket and Teflon inner insulators provide the fire protection to run these cables in the walls or Air Plenums without a conduit. All of our Plenum HDMI Cables are compatible to the latest HDMI standard and will pass all resolutions up to 1080p or 1920 x 1200. Plenum HDMI Cables are a must have for any system integrator or installer performing an installation in any School, University, Hospital, Government or other commercial building. The plenum space above dropped ceilings and under raised floors is the optimal place for routing communication and A/V cables. 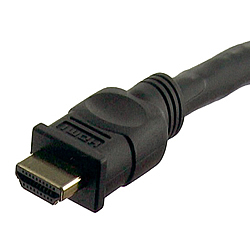 HDMI Cables are used for connecting video projectors, lcd and plasma displays. With the variety of Digital Equipment being available to everyone now, the Plenum HDMI Cables would be the best cables to use to get the highest video and audio quality.